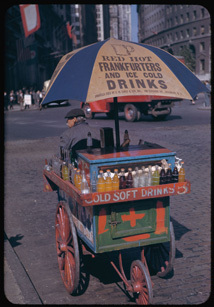 Portable soft drink stand at Bowling Green Office Building, New York City, October 1, 1942. Copyright © 2004, The Trustees of Indiana University. The Charles W. Cushman Collection is D-Lib Magazine's featured collection this month. International Conference on Research Trends in Science and Technology, 7 - 9 March 2005, Beirut & Byblos, Lebanon. Call for papers. Paper submission deadline: November 15, 2004. Informing Science + Information Technology Education (InSITE), 16 - 19 June 2005, Flagstaff, Arizona, USA. Call for papers. The submission date is 30 November 2004. Information Architecture (IA) Summit 2005 - Crossing Boundaries, 4 - 7 March 2005, Montreal, Quebec, Canada. Call for posters. The deadline for submission is 5 December 2004. Librarians for the 21st Century, Institute of Museum and Library Services (IMLS). Call for proposals. The submission date is 15 December 2004. The 9th Pacific-Asia Conference on Knowledge Discovery and Data Mining (PAKDD-05), 18 - 20 May 2005, Hanoi, Vietnam. Call for papers. The submission date is 22 December 2004.